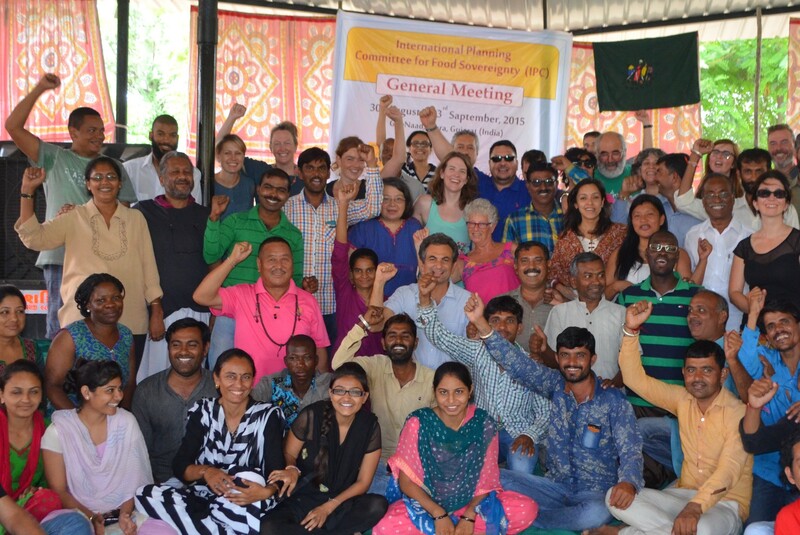 We, the 56 representatives of small farmers, agricultural workers, fishing communities and fish workers, pastoralists, Indigenous Peoples, consumers, NGOs, women and youth, representing CSOs at the local, regional, national and international levels in the region of Europe and Central Asia, came together in Antalya, Turkey, on May 2-3, 2016 to provide our contributions to the 30th FAO Regional Conference for Europe and Central Asia (May 4-5-6, 2016, Antalya, Turkey). We appreciate the efforts of FAO in supporting the civil society and democratic grassroots movements (CSOs) to collectively strengthen the voice of the millions of small-scale food producers and family farmers who are recognized by this regional FAO conference as the backbone for rural development and improvement of livelihoods, and who provide the bulk of our food. They, together with consumers also represent those most affected by unsustainable food systems. As civil society organisations, we wish to emphasize that we contribute on a daily basis to achieving the SDGs and the FAO objectives at local, national and regional levels, and we are committed to continue doing so. Food policies at local, national, regional and global levels should relate to the realities of peoples, small-scale food producers, workers, consumers, women and youth alike. CSOs bring together democratic grassroots movements and are thus the best placed to provide direct, evidence-based knowledge of these realities. CSOs are organized to represent these various constituencies of those affected by agriculture and food-related policies, not as passive beneficiaries or mere input-providers, but as active rights’ holders who are entitled to be involved in policy processes that directly affect their very lives as well as the environment in which they live, and the markets on which their livelihoods depend. We call on this conference to address the humanitarian crises in the region that leads to the influx of hundreds of thousands of refugees, migrants and internally displaced persons fleeing conflicts and situations of despair. This is the result of war, low intensive internal conflicts or deprivation of means to a dignified life, and we must ensure that their right to food and all other human rights are duly respected. We condemn the policies that have caused this war, conflicts and deprivation in the first place, and also the treatment of refugees, (forced) migrants and displaced persons that fails to respect their fundamental human rights. FAO should and can play an important role in ensuring that they are food secure, have access to natural and other productive resources, have greater access to healthy nutritious food, with special emphasis on women, children and elderly persons. Several of our CSOs are currently working in different ERC countries to support asylum seekers access to land to grow some of their own food. FAO should also facilitate and support these initiatives. 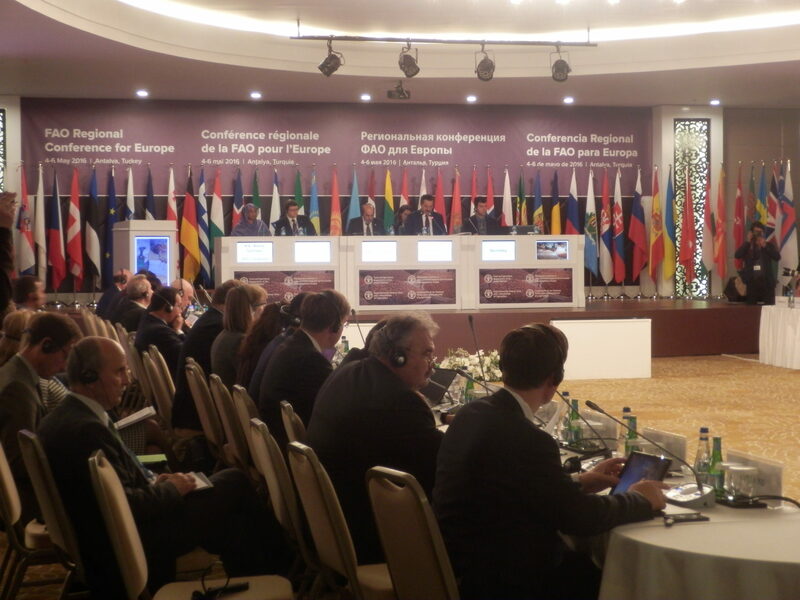 We also call on this FAO Regional Conference in Antalya to be a milestone for setting a coherent and holistic policy framework that reaches beyond business-as-usual. The only way to overcome poverty and malnutrition and ensure food security is through a human rights’ based approach that respects nature. Current international trade policies have failed dismally. However they still largely shape our food policies, despite continuous violations of human rights, persistent food and nutrition insecurity, and their dramatic consequences on our Planet. The only way to overcome this is through a new policy framework based on human rights and food sovereignty. Our current food system is socially, ecologically and economically unsustainable. We need an urgent and profound transformation of our food systems to ensure a sustainable future for people and nature in all the countries of our region. FAO has an important role to play at regional and national level to ensure these aspects are fully implemented. The current food system is unfair and patriarchal, so for us, it is a critical priority to develop gender sensitive policies that promote women’s empowerment and gender equality, ensure a fair share of the benefits of our work, guarantee access to natural resources and means of production, and the access to decision-making spaces. It is necessary to recognize and value the role that women play in food sovereignty and nutrition. The traditional knowledge and (unpaid) daily work of women continues to ensure the protection of territories and biodiversity today as in the past. To move forward with this agenda, we highlight the importance of proposals made by the women’s movement and the feminist economy, in which the sustainability of life is a central issue for the development of a sustainable future. We appreciate that FAO recognizes our agroecological knowledge and practices. These are essential in meeting diverse goals such as in reducing rural poverty, eradicating hunger and malnutrition, achieving sustainable agriculture and development, fighting climate change, creating decent work for youth, reducing dependence on external agro-chemicals, increasing involvement of local communities and Indigenous Peoples, especially at community level for soils, water, biodiversity conservation and women’s knowledge of seed-saving and exchange. Agroecology is, however, still far from being fully acknowledged by the FAO and Member States as the alternative to unsustainable food systems. This is often aggravated by lack of meaningful consultation with and participation of our constituencies. Our governments have been contradictory in their actions by actively promoting and sponsoring the destructive industrial agriculture model, in spite of the important body of scientific evidence that it makes a significant contribution to climate change; they have also allowed the grabbing and destruction of land, water, fish stocks and other natural resources by corporations and sovereign funds, as well as the destruction of our constituencies’ livelihoods. All over the world, people’s access to the natural resources on which they depend for their livelihoods and ways of life is being ring-fenced by (trans)national capital and state predation. This is equally true for the ECA region, where land and water grabbing, regressive laws on seeds and genetic resources, deforestation and the erosion of biodiversity and failure to manage fish stocks, create an adverse environment for the region’s small-scale food producers, fishers and rural peoples. These developments run counter to the vision put forward by the CSOs of the region for whom natural resources are part of the Commons that are an indivisible and indispensible part of their local food systems, living spaces, and territories rather than pure commodities. 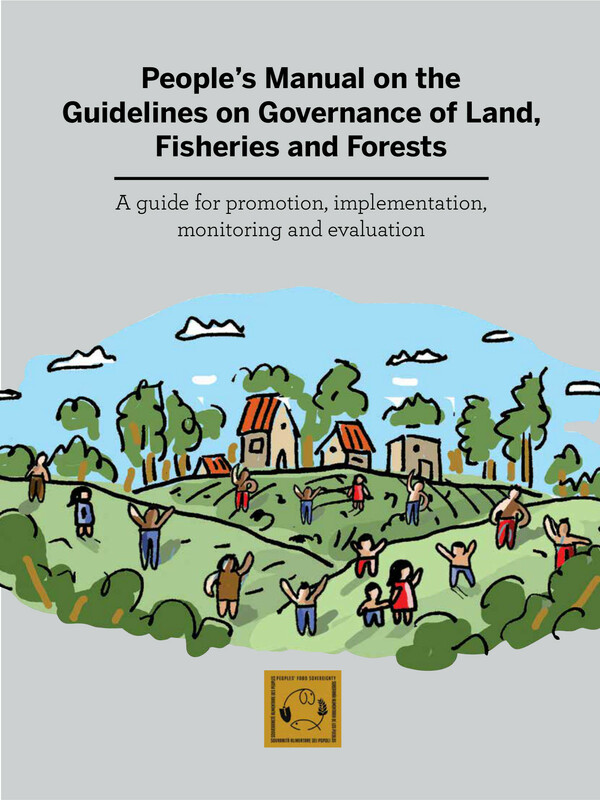 Securing access to and effective control over land, water, fish stocks and fish, seeds and forests, is therefore identified as a key priority area for CSOs in the ECA region. The FAO Voluntary Guidelines on the Responsible Governance of Tenure of Land, Fisheries and Forests (VGGT) and the FAO Voluntary Guidelines on Securing Sustainable Small-scale Fisheries (VGSSF) are critical tools to secure the tenure rights of the region’s small-scale food producers and family farmers and secure access to fish stocks and fish, given that they are anchored in a human-rights based approach, respect nature and explicitly prioritise vulnerable and marginalised groups. CSO’s however still perceive a bias in which the governments of the ECA region interpret these Guidelines, seeing them primarily as an instrument for their development cooperation work in the global South, rather than to be applied and translated into public policy “at home”. Communities need access to knowledge and education as a common good. It is important to recognize the value of traditional knowledge that has been central to food sovereignty for centuries. Traditional knowledge must be valued and recognized at the same level as expert knowledge by governments and FAO. We need to reinforce a deeper dialogue between these two types of knowledge. The bulk of the food consumed in the world and in the region is produced by us, the small-scale food producers and family farmers. Most of this food is channelled through the local and territorial markets, our markets. They are the most important for food security and nutrition. Our markets are situated in and identified with specific territories. In this sense they are localized. They can range from village to national, or regional level; they can also be trans-boundary. They can include rural, peri-urban and urban areas. Building on our local and indigenous knowledge, they perform multiple functions within their given territories, starting with but not limited to the provision of diversified and nutritious diets, their contribution to the territorial economy and employment, to the defence of biodiversity and territorial ecosystems. Local and territorial markets are central to the realisation of many SDGs. They are highly inclusive of and accessible to small scale food producers and other categories of food-insecure people and provide quality food to consumers. They can be especially advantageous to producers when they involve direct “farm to fork” or “deck to dish” sales such as Community Supported Agriculture, Community Supported Fisheries and farmers’ markets. Short supply chains that eliminate or reduce the role of middlemen benefit both producers and consumers. We want these markets to be recognized and supported by appropriate public policies, and request support for increasing mapping of relevant data to make them more visible. Public procurement at local level should also prioritise access for groups of small holders. Public policies should not create opposition between food standards/food safety regulations that should be context appropriate, and the access of small-scale food producers to local and territorial markets. The following recommendations are put forward to the FAO Regional Office, Country Offices, and the governments of the ECA region. Recognise, take stock of, and monitor pressing issues linked to land, water, seeds, fish stocks and forests, paying special attention to the tenure rights of vulnerable and marginalised groups, especially the region’s small-scale food producers of the various constituencies. Commit to the full implementation of the VGGTs in the region, with the understanding that the VGGTs are much more than a tool for establishing a land registry and that they should address all fundamental inequalities in the access to and control of natural entities. Ensure that CSOs in the region (and not simply big donors) are active participants and true partners in the dialogue to identify the pressing issues linked to natural resources and in the implementation of the VGGTs in the region. Traditional sustainable fish(eries) knowledge and practices should be validated and decentralised (community-based), co-management should be promoted. Fishers need to be involved in data collection and analysis. Fishers need to be involved in data collection and analysis. Both professional and recreational fishers should benefit equally from management of inland fisheries. Management should be focussed on optimizing fish harvesting to enable professional fishers to fish in a sustainable way, and also earn a decent livelihood and provide healthy protein to local communities. The needs of recreational fishers can also be addressed in a non-competitive way. The roles of small-scale fishery workers throughout the value chain need to be recognized and respected, particularly women who make up at least 50% of the workforce. Women are often engaged in pre-harvest and post-harvest activities, and often engaged in support roles that are frequently not recognized and poorly paid. FAO and government policies should recognize that it is not international trade, but local and territorial markets that are the most important space of food provision, and as stated above, they must be better understood, documented and supported in the work-stream of Connecting Smallholders to Markets. We welcome the recognition of SDGs as universal and indivisible, and therefore relevant to and implemented by and in all countries, including the developed ones. National strategies to realise them should also ensure they facilitate – rather than impede – their realisation in their own and other countries and at global level. The challenges of realising the SDGs and human rights cannot be met by focusing on the intensification of agriculture, fisheries and aquaculture, or by a process that provides the corporate sector with a predominant role in the SDG 17: Strengthening the means of implementation and revitalizing the global partnership for sustainable development. Instead we urge the FAO and States to address the structural causes of our unsustainable food systems, challenge their power structures, and emphasize the transformative potential of our sustainable food systems. We therefore wish to draw your attention to the fact that SDG 12 on sustainable production and consumption patterns, and SDG 13 on combating climate change are particularly relevant to small-scale food producers and consumers. Unsustainable production and consumption patterns and greenhouse gas emissions of the ECA region, in particular in those of its rich Member States, are a significant cause of hunger, food and nutrition insecurity both in their own and in other countries. Small-scale producers on the other hand generally use low-impact methods of production and small amounts of fossil fuels, all of which naturally mitigate climate change. The work on SDG 2 includes not only farmers but also fishers and Indigenous Peoples. Even though SDG 14 on water and SDG 15 on territorial ecosystems are considered by FAO in their contribution to the realization of Goal 2, fishing communities and fish-workers as well as Indigenous Peoples must be recognized as key stakeholders and participants in the governance of these resources. We acknowledge the recognition of SDG 8 on full and productive employment and decent work for all. However, we are concerned that the FAO priorities completely fail to acknowledge the contribution of agricultural and food workers to achieving decent work. The waged workers do not own or hire the land they work on and as such are a distinct group from small-scale farmers. The creation of economic growth and increasing income for employers often fails to result in the payment of a living wage to waged workers. We also stress the importance of social protection policies to ensure sustainable livelihoods for those who have precarious jobs, or those who are not able to access jobs (including seasonal agricultural workers, migrants, elderly, jobless, sick people). We call on governments to implement policies that guarantee living wages and income to all as well as comprehensive social protection policies to lift people out of poverty and malnutrition. FAO and governments should ensure the application of the fundamental and sector-specific ILO Conventions in order to achieve a fairer distribution of value in the food chain and thus reduce poverty in rural areas. Agricultural and fish workers need to be able to organise in independent, democratic trade unions that represent their views and to be able to bargain collectively to improve their working conditions and get paid a living wage. We urge FAO and governments to increase their efforts to eliminate forced labour in the food and agricultural sector. SDGs should provide a radical space for young people to contribute to the social and ecological transformation that is underway in many of our societies. Youth bear the responsibility for carrying forward the collective knowledge learned from their parents, elders and ancestors into the future. It is essential that the policies create the space and conditions for youth to start practicing their livelihoods, including by ensuring them access to income, resources, decent work, education and knowledge. Pulses link nitrogen from the air to soil and plants. However if chemicals, pesticides or other ecologically devastating production techniques are used in their production, the beneficial role of pulses becomes ecologically devastating. Finally, we welcome the FAO Strategy on Partnership with CSOs and the re-affirmation that the views of independent CSOs are recognized and contribute to the policy, normative and technical discussions convened by FAO. We welcome the proposal to further strengthen relations between FAO and CSOs in the region and to increase the involvement of CSOs in policy-making processes and the monitoring of policy implementation that specifically concerns the region. We welcome the support the creation of a CSO Facilitation Committee to contribute to this process in a constructive way. We are committed to ensuring it will work to fulfil this mandate, and look forward to a constructive dialogue between the FAO Regional Office, FAO Sub-Regional Offices, governments and CSOs. We also welcome you all to meet us at our second Nyéléni Europe Forum for Food Sovereignty that will be held in Cluj-Napoca in Romania from the 26 – 30 October 2016.